Beachfront Villa, 3 Bedrooms, 3.5 Baths, (Sleeps 6 max), Amazing Views! Un-plug, relax, and reconnect with family, friends and nature at Casa del Perro Feliz. Enjoy ocean views from every room! Well appointed and maintained, this 3 Bedroom, 3 1/2 bath beachfront villa is located on quiet, security gated, Tankah Bay minutes from Tulum and the Tulum Ruins. Tucked into the curve of the bay, the villa is built among the palms and the indigenous trees on a half acre lot, behind a large, gated, stone wall. Casa del Perro Feliz has one of the larger lots on the bay with 99’ of beach frontage. The house is very comfortable and open, and has many windows with magnificent views. Our beach is quite private and is the perfect place to launch your kayak, go snorkel, or just take a dip in the warm Caribbean waters. The floor plan is very user friendly, and all bedroom suites have their own baths, pillow-top mattresses, box springs and cotton bed linens. The villa features an open floor plan with Mexican tile floors, Mahogany trim and doors, a gourmet kitchen, and handmade, custom, furniture. Our on-site caretakers are there to make your stay at Casa del Perro Feliz a comfortable and enjoyable one. If you don't feel like cooking, you can hire Lourdes who is an excellent cook, prepare your breakfast or dinner for a reasonable fee. Our caretakers live on-site, in a separate house. They, along with our English-speaking property manager are there to help make your visit enjoyable. Designed to be environmentally friendly and not require air conditioning, the passive solar design, 9 1/2 ft. high ceilings, Hunter ceiling fans, and strategically placed, screened windows, provide soothing sea breezes along with views of the ocean and keep the house cool and comfortable. Enjoy the sound of the waves lapping on the shore, and the breezes rustling in the palm leaves instead of the hum of the air conditioner. Shaded by the native palm trees, the front of the house, and our palapa, are ideal spots for relaxing in one of the hammocks with a good book. Casa del Perro Feliz has five Ocean Kayak brand kayaks and three bicycles for guests to use. We have found the kayaking and snorkeling in front of the villa is some of the best in the area. Snorkeling we see a multitude of various fish including, Queen Angelfish, Permit, Trunk, and Parrot fish. No trip is complete without a visit to the rooftop which features a built-in sofa which seats 6 comfortably, and has a million dollar view. Relax with a Margarita or your favorite drink, and enjoy the stunning views of the turquoise Caribbean, and watch the indigenous birds and the sunset over the jungle. It is the perfect way to end a great day at the beach! If you’ve never visited Tankah before, you’ll be delighted to see that it is a small community in between Tulum and Akumal which has nice beachfront homes, a few boutique hotels with restaurants, and is situated on a quiet, sparkling bay, with white sand beaches. Kayak, bike or walk to Casa Cenote for a snack or a cervesa and a swim in the Cenote. We have been visiting the area for over 30 years, and feel that Tankah offers the best of both worlds; nature & seclusion with nearby amenities such as shopping, restaurants and cultural sites. Casa del Perro Feliz has been the home away from home for many, many, satisfied guests. We have found that the volume of repeat guests is by far the best testimonial we could ask for! We invite you to visit Casa del Perro Feliz! For more information please contact us - " Ask Owner a Question"
We bought our land in 1999. After working on the land and learning about it we designed the house and had it built in 2003 and have been enjoying it ever since! We had been visiting this general area since the mid 1980's and found Tankah to have what we were looking for - a quiet area with astounding natural beauty, yet close to so many conveniences, attractions and places to visit and explore. We feel very fortunate to have a home in this magnificent area and enjoy sharing it with others who can also appreciate it. We love the quiet, natural beauty of our land and all of our trees, the bird watching, and our beautiful ocean and jungle views. We also love the great snorkeling and kayaking that we can do right in front of our own house, along with listening to the waves at night as they lull us to sleep. The ocean is 25 meters from & the door! Quiet, private house in security gated community. Villa is steps from the ocean, the beach - sandy with normally calm waters, is great for snorkeling and kayaking. Ocean views from every room! 5 Ocean Kayaks, incl. glass bottom kayak for reef viewing. Kayaks are for use INSIDE THE REEF ONLY. 2- Fuji MTN Bikes, 1-29'R MTN bike, Rooftop Observation Area, Great Birdwatching! Onsite Caretakers, Maid Service 6 days per week, Linens provided, incl. beach towels. Board games,stereo w/I-POD docking station, Purified Drinking Water supplied, Breakfasts and dinners can be prepared onsite for a nominal fee, plus food costs. English speaking Property Manager and caretaker, Shaded Hammock areas - Hammocks provided, Walking distance to restaurants & Manatee Cenote, NO SMOKING IN HOUSE , ON ROOF, OR IN PALAPA please! Casa del Perro Feliz is a favorite for visitors to the Tulum area. Contact us now to book your vacation in Paradise! LOVED this beautiful home in paradise!! My hubby and two children had the most lovely vacation at Casa del Perro Felix during spring break! The setting is stunning, with views up and down the cove and perched directly on the beach. We loved that it was quiet with not many people, but could walk to a couple of restaurants and bike to the local cenote. Be sure to bring water shoes as the water is pretty rocky. The house is perfect - clean, open and cool. We biked, swam and took the kayaks out daily. We went into Tulum a few times for meals and to explore other beaches, but for the most part stayed home and had home cooked meals prepared for us by Lourdes and Rubin. They were SO YUMMY! I highly recommend you have at least a few meals prepared. Lourdes and Rubin were so kind and were available whenever we needed help or had questions. And the owner Ann was so wonderful to work with! We will definitely be back!!! We have stayed in the big places in Mexico (Cancun & Cozumel). This place (Casa del Perro Felix) blew us away. The positives on this fantastic place are astronomically impossible to calculate. We enjoyed the peaceful beach and neighborhood. You will not have a better bay view in such a high end house at this price. The house is decorated with hand made furniture and artwork from the area. Very comfortable if you are lounging around or just enjoying the scenery. Beds are very comfortable, kitchen is well laid out and stocked with equipment. You have EVERYTHING you need for a dream vacation. The caretakers (Lourdes & Ruben) are unobtrusive and absolute gems. We elected to have them cook our meals for us. I cannot say enough good things about all of their meal preparations. My wife is a strict vegetarian who is also very picky about the products used in the kitchen. Lourdes and Ruben understood and provided us with a stellar culinary week. You cannot go wrong employing them to be your kitchen magicians! The area that the house sits in is a perfect place to stage your activities. Whether it's exploring the ruins of Tulum, swimming in a cenote, or just enjoying the peace and quiet of Tankah Bay, this house rocks. It's hard to beat walking out the door the first thing in the morning with a cup of coffee in hand and seeing the beautiful blue waters of the bay right in front of you. Ann (owner) was so helpful in everything associated with her property. She provided us with information about the area and what to expect. With Ann, all of our travel plans went as we had expected. We found her helpful and informative - she has been coming down to this area for 30+ years - Ask her, she will know. We will come back again and again - this place is what a Mexican vacation is all about. Thanks Ruben and Lourdes, your food and hospitality is the best in your country. We LOVE this place ! Can't say much more. Fantastic house, amazing location, great caretakers (and cook!). One of the best vacation locations I've had, ever. We loved the sunrises, the sunsets, the sun, the rain and everything in between. Didn't want to leave. Tasol. My family and I (12 year old son and husband) stayed at this amazing house for 9 days. The pictures do not do it justice. The property is absolutely amazing! The views are gorgeous from the bedrooms, the rooftop deck, the hammocks and, of course, from the beach itself. We loved using the kayaks that were provided. We snorkeled right off of the beach and saw a large variety of beautiful fish and coral. The palapa with hammocks was perfect... we enjoyed them every day. We enjoyed riding our bikes to the local restaurants/bar and to the little shop down the street. 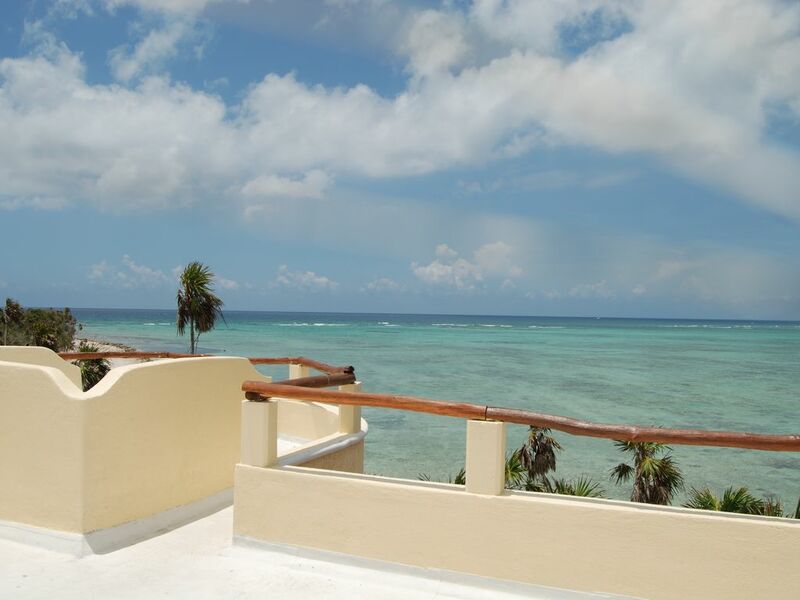 This was a perfect homebase location to travel to several of the Mayan ruins and eco-parks. The property manager, Ruben, and his wife, Lordes, were the best!! We had them cook breakfast and dinner for us several times. The food was absolutely AMAZING!!! They served breakfast outside, which was wonderful. Also, Ruben makes an excellent Margarita! We loved having the dogs on the property. We were able to play and go for walks with them... Very cute! The house was immaculate! It was cleaned every day. Ruben and Lordes helped us figure out where to go, where to eat, etc. I can't say enough about them. We were fortunate enough to meet Ann, the property owner, when we arrived. She was lovely and so easy to work with. I would not hesitate to recommend this house to anyone and I hope that my family and I get to return very soon. We did not want to leave!! We spent a wonderful week in Mexico and LOVED this house. It was absolutely luxurious for 3 adults and two young teens. The house itself it very nice -- extremely well maintained with beautiful wood and tile throughout. SO nice to stay in a house where we did not need air conditioning, because the house is perfectly positioned on the property to allow cooling, relaxing ocean breezes to blow through day and night. With lounging, kayaking, and snorkeling right outside our door, we spent more time at the house than we did exploring the area (which is also lovely!). The caretakers who live on-site are warm, friendly people who made us feel very welcome (and cooked us some amazing meals). The house is close to cenotes, shopping, yoga studios, Mayan ruins, restaurants, and all manner of fun adventures -- yet private and away from it all! Ann is great to work with, and provided us with lots of information that made our vacation PERFECT. Our stay at Casa del Perro Feliz was muy tranqulio! We loved Casa del Perro Feliz!! We arrived late at night due to a delay in flight. Ruben, the onsite property manager greeted us and showed us the Casa which is quite lovely! We were also greeted by Fancy and Maggie the two "happy dogs" who live on site as well. Ruben's wife Lordes had made us a lovely dinner which we enjoyed even at 1:00am! It was a delight to wake to the tropical birds, ocean breeze and the sound of the waves.The roof top lounge area was wonderful! We started there with our coffee in the mornings and ended with a beverage as we watched the moon rise over the ocean each night. From the back doorway, it's 35 paces to the waters edge! The Casa is a dream realized with personal touches, nice sitting and dining areas, has comfortable beds, nice sheets and towels and is kept immaculate by Ruben and Lordes. We also loved the grounds and outdoor areas to hang out - nice oceanside recliners, hammocks and an outdoor eating area where we had breakfast cooked by Lordes and Ruben each morning. We took advantage of the cooking service offered by Ruben and Lordes and had them prepare every breakfast and four dinners. The food was absolutely amazing and lots of it! Fresh squeezed juice each morning and platters of fresh fruit. Lordes spoiled us with her cooking talents! Each night at the Casa, Ruben served us delicious and strong margaritas oceanside along with Lordes' guacamole and salsa! After a day of site seeing, we sure looked forward to this daily treat! We loved the location of the property in that it is away from the hotel zone and in a guard gated community that is low key and tranquil. One of the best Cenotes for diving and snorkeling is walking distance as well as a fun restaurant/bar called Casa Cenote. There is a dive shop walking distance or a short drive up the road. We enjoyed the kayaks and mountain bikes that were provided and even hired the massage therapist who came recommended, oceanside! We had two teenage boys and they loved Casa del Perro Feliz and were able to take off on the bikes and explore. The property is in a location that was easy to get to the ruins and sites in and around Tulum. As I write this I'm thinking, "Oh my goodness! I need to go back!!" And we will!! Snorkeling, Scuba Diving. Five Ocean Kayaks onsite with life jackets, three Bicycles for guests use, Deep Sea Fishing, Private Road for Jogging & Walking, Mayan Ruins, Cenotes, Golf nearby in Akumal and Puerto Aventuras, Great Bird & Wildlife Watching, On-site Massage Therapist available for an addtional fee.